SUNDAY was a day of social commentary, World music and crowd favourites at Bluesfest. Being from Africa, Papua New Guinea, Melbourne or Byron Bay, most of the music yesterday at Bluesfest - and the artists - had a strong social and political message. Local singer songwriter Xavier Rudd performed at the festival for the first time with his new band, The United Nations. Besides a number of new colourful feathers in his top hat, Rudd offered songs from his latest album, Nanna, launched only weeks ago. 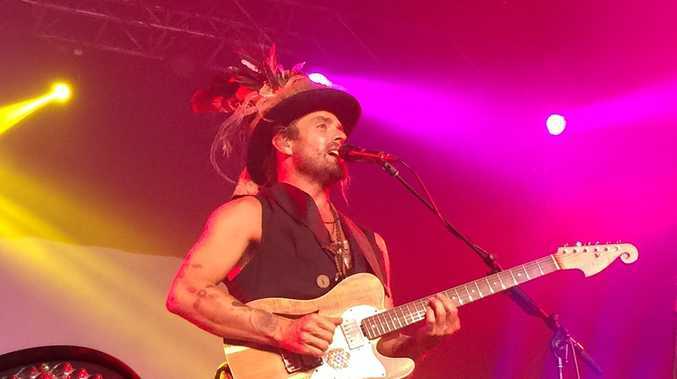 Xavier Rudd had a message of hope and social change for his audience last night. "Things may look a bit hard but things will change. Our Government has been denounced here and across the world, and things will change," he said. Afro diva Angelique Kidjo, from Benin, reminded her audience that most popular music has African roots, being Salsa, Blues or rock'nroll. Kidjo offered a strong performance with afro rhythms that had crowds dancing, while she sang in African languages about peace and social justice for all. Another band with a strong social message was Blue King Brown, a local band that started their career jamming in the streets of Byron Bay over a decade ago. Lead singer Natalie Pa'apa'a offered a clear message for her audience. 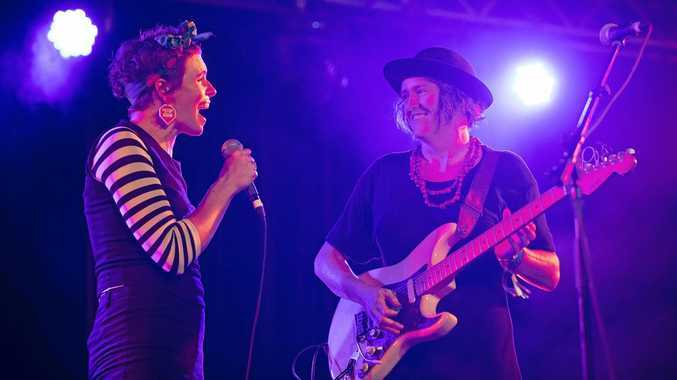 "Our music is dedicated to the aboriginal people of this country and of all nations, because they know what is like to be alienated by a system that does not work for us, that needs to be changed," she said. The message '#sosblackaustralia' was projected into the stage's background during their show a number of times, referring to the campaign against the possible closing of remote aboriginal communities in Western Australia. "Australia is the only country in the world that did not signed a treaty with its aboriginal people after colonization," said Pa'apa'a. Legendary US singer Mavis Staples, 75, wowed audiences with a strong blues show. Staples, who toured the US with Martin Luther King Jr in the 1960s as part of the Civil Rights Movement, also had a message for the audience. "In 1964, we were part of the historic march from Selma to Alabama. I was there, and I am still here," she said. Staples was referring to the Civil Rights march led by Dr King to the capital of Alabama in 1964, depicted in the Hollywood film Selma last year. "We must all work towards peace, because without peace and equality society cannot move on and become better," Staples said on stage. Melbourne Ska Orchestra, fronted by Nicky Bomba, also offered a strong political message during their second performance at Bluesfest. Melbourne Ska Orchestra once again invited Torres Strait Islander singer songwriter Chris Tamwoy to welcome the crowd to country, and to make a statement against the potential closure of remote Australian Aboriginal communities in Western Australia. The evening was closed by Ben Harper and the Innocent Criminals, who attracted over 5000 people to the Mojo tent last night. Also at the end of the evening, Charles Bradley and His Extraordinaires offered a quota of old time soul and funk to Bluesfest 2015. Today, the last day of Bluesfest will feature a mini-yoga festival called Soulshine, fronted by Michael Franti. 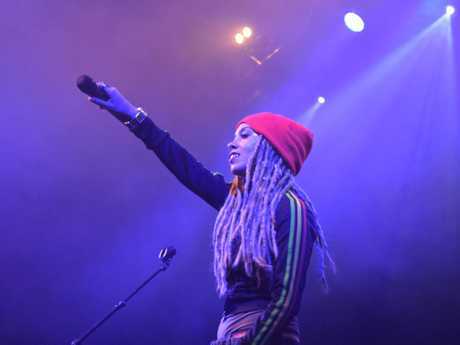 Other performers in today's line up are Paul Kelly, Nikki Hill, John Mayall, Playing for Change, Diesel, Ash Grunwald and, at noon, the winners of the 2015 Busking Competition, Grizlee Train, at the Delta stage. For more details visit the Bluesfest website. 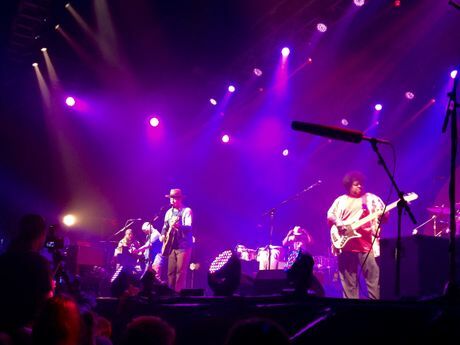 Bluesfest Day 4 recap: Published on 5 Apr 2015. Official Daily Video Release, looking back at Easter Sunday, Day 4 of Byron Bay Bluesfest 2015.